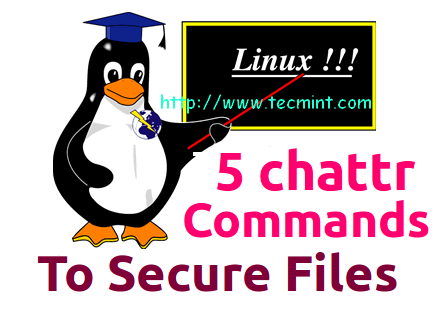 chattr (Change Attribute) is a command line Linux utility that is used to set/unset certain attributes to a file in Linux system to secure accidental deletion or modification of important files and folders, even though you are logged in as a root user. In Linux native filesystems i.e. ext2, ext3, ext4, btrfs, etc. supports all the flags, though all the flags won’t support to all non-native FS. One cannot delete or modify file/folder once attributes are sets with chattr command, even though one have full permissions on it. This is very useful to set attributes in system files like passwd and shadow files wherein user’s info are contains. Here, we are going to demonstrate some of the chattr command examples to set/unset attributes to a file and folders. For demonstration purpose, we’ve used folder demo and file important_file.conf respectively. Before setting up attributes, make sure to verify that the existing files have any attributes set using ‘ls -l‘ command. Did you see the results, currently no attribute are set. To set attribute, we use the + sign and to unset use the – sign with the chattr command. So, let’s set immutable bit on the files with +i flags to prevent anyone from deleting a file, even a root user don’t have permission to delete it. Note: The immutable bit +i can only be set by superuser (i.e root) user or a user with sudo privileges can able to set. After setting immutable bit, let’s verify the attribute with command ‘lsattr‘. Now, tried to delete forcefully, rename or change the permissions, but it won’t allowed says “Operation not permitted“. In the above example, we’ve seen how to set attribute to secure and prevent files from a accidental deletion, here in this example, we will see how to reset (unset attribute) permissions and allows to make a files changeable or alterable using -i flag. After resetting permissions, verify the immutable status of files using ‘lsattr‘ command. You see in the above results that the ‘-i‘ flag removed, that means you can safely remove all the file and folder reside in tecmint folder. Setting immutable attribute on files /etc/passwd or /etc/shadow, makes them secure from an accidental removal or tamper and also it will disable user account creation. Now try to create a new system user, you will get error message saying ‘cannot open /etc/passwd‘. This way you can set immutable permissions on your important files or system configuration files to prevent from deletion. Suppose, you only want to allow everyone to just append data on a file without changing or modifying already entered data, you can use the ‘a‘ attribute as follows. After setting append mode, the file can be opened for writing data in append mode only. You can unset the append attribute as follows. Now try to replace already existing content on a file example.txt, you will get error saying ‘Operation not permitted‘. Now try to append new content on a existing file example.txt and verify it. Here is the example to test 'a' attribute mean append only. To secure entire directory and its files, we use ‘-R‘ (recursively) switch with ‘+i‘ flag along with full path of the folder. After setting recursively attribute, try to delete the folder and its files. To unset permission, we use same ‘-R’ (recursively) switch with ‘-i’ flag along with full path of the folder. That’s it! To know more about chattr command attributes, flags and options use the man pages.